Pressure cook toor dal with pinch of turmeric powder and curry leaves. Soak tamarind in warm water and extract juice from it. Heat oil in a pan; add chopped shallots, garlic and green chilies fry for few minutes then add chopped tomatoes. Cook covered till the tomatoes are soft. Then add chili powder and coriander powder and stir for few minutes on medium flame. Mix it with cooked dal; then add salt and sufficient water, stir well and allow it to boil. 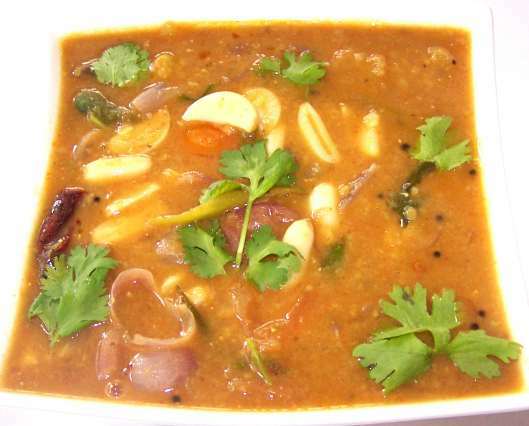 When it starts to boil add tamarind juice, a pinch asafoetida powder and Fenugreek seeds powder. Keep it on low flame till the gravy thickens. Heat oil in a vessel and add the mustard seeds and allow them to splutter; then add shallots and sauté till they turn light brown. Now add cumin seeds, urad dal, dry red chilies and curry leaves. Pour it to the Sambar.